Hometown: Originally from Marine Park, Brooklyn, but spent most of my formative years on Long Island. Education: Will be graduating next spring from Fordham University with a B.A. in Theatre. Knock on wood. Favorite Credits: My favorite role of all time is Jimmy the Newsboy in Charles Busch’s Times Square Angel. I’ve done it every December at Theater for the New City for ten years with the same cast, and those people really feel like family to me. The part was written for me when I was 11 years old, and I still wear the same knickers. Also- and I’m not ashamed to say it- I played Sweeney Todd when I was 17. And my grandma said I was better than Johnny Depp. AND I can’t leave out that wonderful time when James Presson- who’s directing me now in DIVA- cast me as Giles Corey in The Crucible, and, because James is a criminal and a madman (and a bit of a genius too), he staged Giles’ arrest as a recreation of the carbon-freezing scene in "The Empire Strikes Back". So I basically played Han Solo. Why theater? : I tried to think of something witty to say here, I really did. But this question made me feel a tad sentimental. I think that theater has the power to bring hope, comfort, and unity to theatergoers and theatre-makers alike. I really believe that sitting with a group of people, and watching another living, breathing person tell a story is the most important ritual that we as humans have devised. 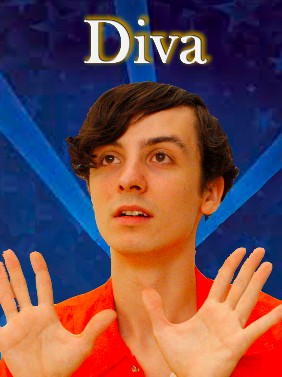 Tell us about DIVA: Desmond Channing, a dethroned high school drama queen, tries to make sense of his impending execution by reenacting the events leading up to his murder of archenemy Evan Harris in an impromptu prison cabaret performance. It runs at Theater Row as a part of the United Solo Theatre Festival, on October 7th at 6pm, October 10th at 7:30pm, and October 23rd at 7:30pm. Less Than Rent Theatre, of which I am a member, is producing. I’ve written the book, music, and lyrics, and I play all of the parts. And I do a sword-fight with myself. Any questions? What inspired you to write DIVA? : When I was in high school, I was very frustrated that I wasn’t on "Glee", and I was also very frustrated that "Glee" existed. So, I wanted to write a Bizarro-Glee… for myself to star in someday. I watched a lot of TCM as a kid, and so I decided to mash up the plots of "All About Eve" and "Sunset Blvd", with nods to "Mildred Pierce", "Gone with the Wind", and "I Want to Live!". Fast forward to April 2013, when I was in Words, Razors, and the Wounded Heart at Under St. Marks, written by none other than James Presson. He asked me if I had any interest in developing a solo show to do with Less Than Rent. I said yes immediately, knowing that this was the perfect way to resurrect the character from the notes I jotted down in high school. So, I got to work writing, getting a little advice from Charles Busch along the way. Charles has been a dear friend and mentor to me since I was eleven years old, and I knew that he got started in solo performance, and I’ve always wanted to be like him when I grow up, so I’ve really had the urge to try something like this since I was a kid. In fact, as a child, I used to do one-man shows (or one-and-a-half-man, since my little brother ran tech and played miscellaneous characters) in my basement for my parents. My repertoire included Anyone Can Whistle, Sweeney Todd, Company, Assassins, Man of La Mancha, and, at my mother darling’s request, Grey Gardens. What kind of theater speaks to you? What or who inspires you as an artist? : I’m really interested in the intersection of story and spectacle- where the events on stage sweep away the audience, but anything can still happen. Naturally, right now I’m trying to explore that in solo work, so I’m drawing a lot of inspiration from Ruth Draper, David Drake, Edgar Oliver, Taylor Mac, Lily Tomlin, and, of course, Charles Busch. But I draw most of my inspiration from my family and friends. I’m lucky enough to live with two incredible actors (Kyle Walton, and my girlfriend Sarah Hegarty) who keep the creative gears spinning. And my family, especially my younger brother, has given me enough material to last a lifetime. Also, James Presson. If you could work with anyone you’ve yet to work with, who would it be? : Tina Benko. Literally every play I’ve written has a part in it for her. Including DIVA. Which is a solo show. But she stopped returning my e-mails. ARE YOU READING THIS TINA??? WORK WITH ME! LOVE MEEEE!!!!! What show have you recommended to your friends? : Most recently, Mr. Burns: A Post-Electric Play by Anne Washburn at Playwrights Horizons. So inventive, so brilliant, and, ultimately, extremely moving. The end of the second-act was so shocking, that my nose spontaneously started to bleed, and the play’s final image was among the most cathartic I’ve seen on stage. Who would play you in a movie about yourself and what would it be called? : It would be called “Long Day’s Journey Into Trite” and I’d campaign heavily to be cast in it to play myself, but I’m sure that I’d lose out to Nick Jonas. Yet again. What’s your biggest guilty pleasure? : Oh dear. There’s a kind of casserole that I make… The ingredients: melted Nutella, half a stick of butter, diced Reese’s peanut butter cups, a crushed Ritz cracker crust, and a layer of sea salt on top. Put it in the freezer overnight, and the next morning you’ll have what my friends like to call ABOMINATION SNACK. If you weren’t working in theater, you would be _____? : One of those people who stays in school forever and ever. I think that working in a theater is sort of like being in a state of constant education, which I love, so I’d either need to find another job like that, or I’d just want to get degrees in everything. Art, English, History, Philosophy, Theology… But not Math or Science. What’s up next? : Well, I’ve got my final academic production at Fordham University, which is called 6B and is about a group of boys in college living together in a dorm. I’ll be writing and performing in it, along with my five former roommates. We’re very meta. And graduation is just around the corner. But what I’m REALLY excited about is the wedding of James Presson and Rachel B. Joyce, which is in a few weeks. I’m going to be in their wedding party, and I cry every time I talk about it.